Lone Star Emmy & Regional Edward R. Murrow Award winning reporter Shane McAuliffe created & hosts The Texas Bucket List. The show is dedicated to everything you have to see, do, and experience in the Lone Star State and a few things every Texan should venture out to try. 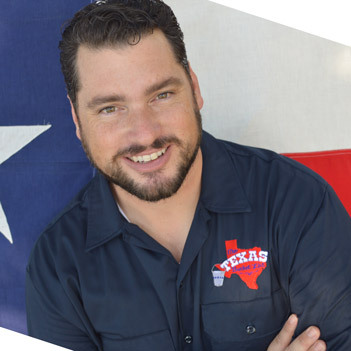 Shane grew up in Round Rock, Texas and spent over a decade at television stations across the state of Texas. After honing his storytelling abilities, Shane followed his dream of being the next Charles Kuralt, Ray Miller, Ron Stone, and Bob Phillips by creating The Texas Bucket List. Sharing the joy, wonder, beauty, & excitement of Texas is what we’re all about. How do you define Texas? It starts with a wide open, beautiful, and enchanted land full of amazing people and places. Then there are the cities, big and small each with their own culture and way of life. When you add these things together, you have an incredible mix of personalities that make Texas what it is today. With stories of the Old West to modern marvels, there are a plethora of sincere stories in our state. Our goal is to feature the stops, hear the stories, and meet the people that are quintessential to the story of Texas. This is The Texas Bucket List. The whole idea of creating a list of people, places, food, and music that all Texans need to experience came about in 2008 when a young sports reporter, me, moved from Austin to Bryan/College Station to further my career in broadcast journalism. Really it was for a girl. After spending time at stations in Abilene, Corpus Christi, and Austin moving to the Brazos Valley was a given considering my fiancé was being promoted to the main anchor position at the CBS affiliate. But when I arrived at KBTX, General Manager Mike Wright and News Director Mike George had other ideas. “You’re not a bad sports reporter Shane but you’re a much better feature reporter, we’d like you to take on more stories like that,” said Wright. “And we’d like you to come up with a summer series for July sweeps, something about our area,” said George. I was a little taken back and a little hurt for a few seconds but like any young journalist will tell you, when somebody gives you a task you take it head on and try your hardest to make it the best television anyone has seen. After brainstorming with my wife, I decided I'd try to stumble my way along and follow in the footsteps of the great storytellers our state has seen. Inspired by reporters like Ray Miller and his expansive knowledge of Texas history on The Eyes of Texas, to the story telling of Ron Stone and Charles Kuralt, these newsmen always awed me. But my biggest inspiration was of course Bob Phillips, the George Strait of Texas TV, at least in my humble opinion. So I started The Brazos Valley Bucket List, a once a year, monthly series, dedicated to everything there is to see , do, and experience in The Brazos Valley. After just the first month on air, people would continually come up to me and compare my storytelling to Mr. Phillips and I was extremely honored. “You need to take your series across Texas,” they’d tell me. “I want to see your reports across Texas,” well after a few years, I decided why not. After getting the blessings from Mike Wright and Mike George, I pursued my dream and in the Fall of 2013 The Texas Bucket List premiered on 12 stations, most notably on KPRC Channel 2 in Houston, the former home of The Eyes of Texas. That fact still chokes me up every time I think about it. After just two years The Texas Bucket List can now be seen on 22 television markets and has been nominated for multiple Lone Star Emmy Awards. I'm now married to that beautiful former news girl and together we have two amazing kids. So thank you for watching, enjoy the show, and God Bless Texas. Shane has been recognized with numerous television broadcast excellence awards including a Regional Edward R. Murrow Award, the Lone Star Emmy Award, the Barbara Jordan Media Award, multiple Texas Association of Press Broadcasters awards, and several Telly Awards. He’s a native of Round Rock, Texas and attended The University of Houston. The Texas Bucket List is produced by McAuliffe Productions, LLC located in College Station, Texas.